We’re now on our fourth content conference, and we learn each time we run them. For the first time, we had more presenters from outside GDS than inside GDS. That’s important because the content community is far broader than GDS. And this conference included more voices from across government than we’ve had before. So far, 85% of the attendees have said the conference was ‘very useful’, and our #ConCon4 hashtag got close to a million views on Twitter. ConCon brought together over 100 content designers across government to share experiences, learn from each other and build together. We wanted the content conference to spark ideas and discussion between content designers and those working in other areas. So 6 out of the 21 sessions were run by experts from outside of the content design discipline. Kit Collingwood, Head of Product Delivery on Universal Credit at DWP, opened the conference talking about what makes a good leader, and how it’s ok to show vulnerability. Kit shared the story of a manager who called a meeting during a difficult project. The manager asked the team if she was ‘screwing things up’. Because of that openness, the team felt comfortable talking about what wasn’t working. She also explained that anyone can lead - regardless of grade or level - and inspired content designers to be great leaders. 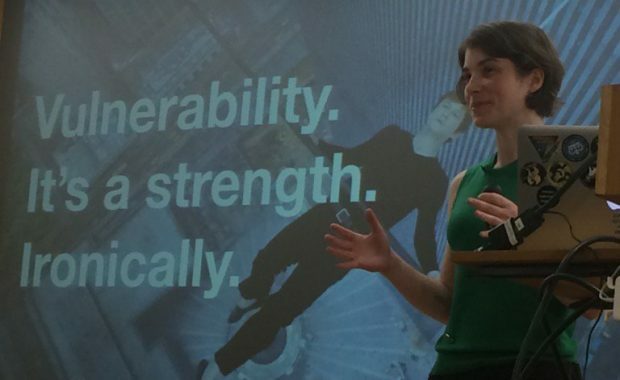 Kit Collingwood: Vulnerability is a strength. Credit: @pnplondon. One of the most popular sessions of the day was from Chris Atherton, a cognitive psychologist turned user experience (UX) designer explaining how our brains hold information. Chris helped the cross-government content community understand how much information users can retain at any point. The answer? Not very much. Lynne Roberts from the Home Office and Padma Gillen from Scroll ran a workshop looking at what a content designer can do on a service that doesn’t have words yet. Padma challenged content designers to lead on the development of services, rather than just tidying up the words at the end. He also showed the cost savings of working with a user-centred design team and making paper prototypes instead of building in discovery with code. 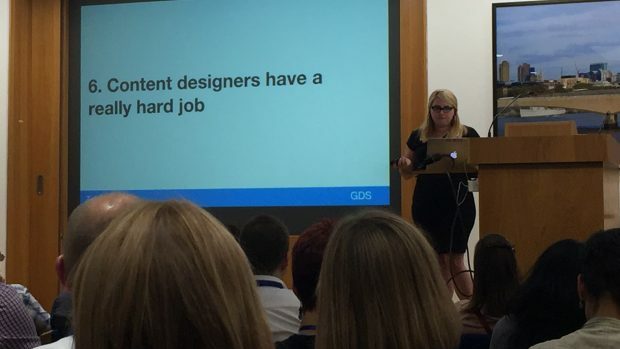 Trisha Doyle: Content designers have a hard job. Credit: @neillyneil. Because content designers work in the middle of things, they need to speak many languages: coding languages to work with developers, policy language to work with subject matter experts, and most importantly, the language of our users. Through workshop discussions, we learned that it’s hard to get other parts of government to understand what content designers do and not just be seen as copy editors. As many workshops were running at the same time, I couldn’t attend them all. We’d love to hear your feedback on any you went to in comments below, feedback forms or email gov.uk-training@digital.cabinet-office.gov.uk. We discussed culture change and the environment needed to for organisations to change how they work. We were joined by 3 heads of content, Sarah Richards, first Head of Content Design at GDS, Padma Gillen, who followed Sarah at GDS, and Trisha Doyle, the current Head of Content Design. The 'you had to be there' moment of the conference happened in the panel talk where milk became shorthand for culture change. Sarah Richards told a story about a developer who, in the early days of GOV.UK, laughed at the multitude of milk bottles in the fridge with names written on them. He bought a big bottle of milk for everyone to share. It’s these small changes at team level, that we can all do everyday, that add up to culture change. At #ConCon4 we had ‘lightning’ (short) talks so people could share what they were working on or thinking about. We had talks on content strategy, agile, consultations and technical writing. We heard about a department who ran a consultation that got so much press attention the website fell over. That department now runs consultations more openly, with stronger infrastructure and better communications. Content designers from Universal Credit made us look at how to move an entire organisation’s language away from the shorthand of acronyms and into the language of users. Trisha Doyle closed #ConCon4 talking about our discovery work on a content operating model for GOV.UK. We’ve got too many things that aren’t being looked at on the site, and it’s sometimes hard for content designers to do the right thing. We need to join up content and services. We’re working across government to fix it. For me, the most interesting talks and workshops were where people shared problems or things that went wrong. The trust within our community has grown so much since the first content conference. We work on different things in different ways but that drive to serve users brings us together. Thanks to everyone who helped, spoke, ran workshops, wrote post-its, asked questions, ate biscuits and listened. If you have suggestions on how to make the next conference better, get in touch with us at gov.uk-training@digital.cabinet-office.gov.uk. We’re adding more regional meetups to our content events calendar this year. These smaller events help us share problems and practice skills. John Ploughman’s blogged about the unconference-style meetups he runs in Nottingham. 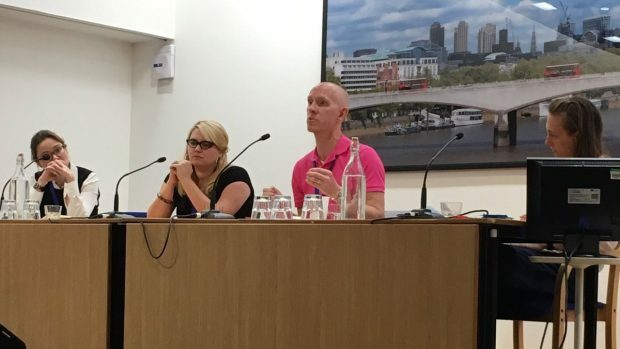 We ran a meetup in Newcastle last June, and blogged about the day. We’re holding another meetup in Leeds in November 2016. We love meetups. If you’d like to start a meetup where you are, let us know and we can help you set it up. Our next content conference will be in March 2017. Tickets for #ConCon4 sold out in 2 days, so keep an eye on Basecamp to find out when #ConCon5 tickets are available, and remember to book early.